When Katie Stagliano was just nine in 2008, she came home with a cabbage seedling as a part of a third grade program with Bonnie Plants. She took care of it, watering it, weeding around it, fertilizing it, and it soon grew to an impressive 40 kg. Realizing that this cabbage needed a special home, she contacted a local soup kitchen in Summervile, South Carolina where it helped feed over 275 hungry people. 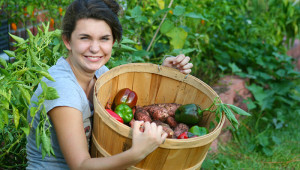 That incident inspired Katie to found her gardening NGO Katie’s Krops in 2010 which offers grants of garden center gift cards to fledgling gardeners ages 9-16 to start their own gardens. Her first garden dedicated to feeding the hungry was in her limited backyard. She currently manages 61 gardens across 21 states, all ranging from Maine to Hawaii. Katie hopes to eventually have gardens in all 50 states. “My dream is that there are no hungry people.”, says this fourteen-year-old. They say that if you ask, then you should receive. This was certainly true in Katie’s case. She won Amazing-Kids.Org’s ‘Launch My Dream’ t-shirt design contest, which helped raise resources to help her in her philanthropic endeavors. When she asked her school to help, they donated a huge plot which the all the students help to keep. The crops are donated to local shelters or soup kitchens. She has succeeded in providing food for more than a million people in the past four years. In March 2011, Kaite was a keynote speaker for Disney’s Magic of Healthy Living and in the audience was her future mentor, Don Goodwin, who believed in her dream as if it were his own. Founder and president of Golden Marketing, he used his connections in the fresh produce industry to find enough supporters for Katie’s Krops to provide grants for other students to help prevent hunger through backyard gardening. Due to her efforts to ”end hunger one vegetable garden at a time”,Katie has won the Clinton Global Citizen Award, the youngest ever recipient. According to President Clinton: “ Tonight I’m proud to honor … a social entrepreneur on pace to take my job before she turns 16.” She has earned widespread media coverage, including appearances on the Disney Channel, CNN, Everyday Health on ABC, and the Nate Berkus Show and articles on MSN and People magazine. The green industry is also pitching in to support Katie’s mission. After reading about Katie’s mission, Aaron Van Wingerden, owner of Dutch Heritage Gardens in Larkspur, Colorado, helped Katie’s dream of having a greenhouse come true. He shipped a 48-ft greenhouse from Colorado to South Carolina and then flew there himself to help Katie and her family construct the greenhouse at one of her garden sites. Bonnie Plants, whose program gave Katie her first cabbage, has also donated seedlings for Katie’s gardens. When the local soup kitchen closed down three years ago, Katie began offering garden-to-table dinners that have provided a free,meal to more than 2,000 hungry people. “I am proud to grow healthy food, prevent hunger and empower kids to grow a healthy end to hunger in their communities,” says this admirable teen.